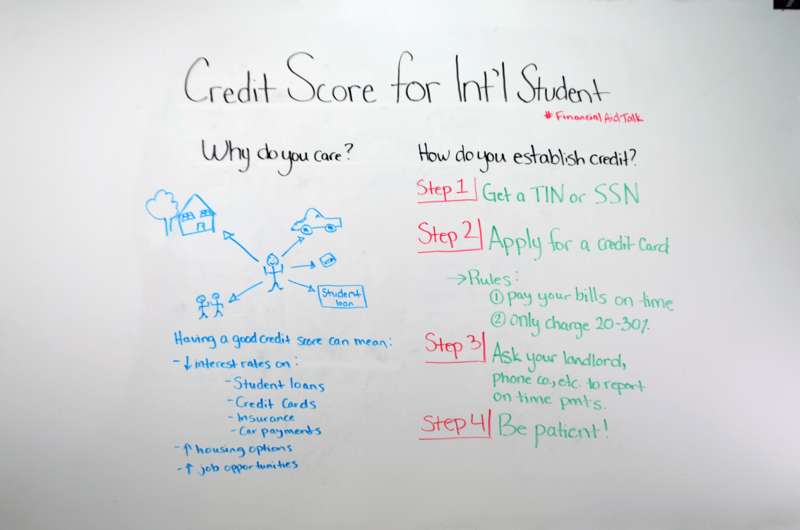 Establishing good credit is important for international students for a variety of reasons. This short video will explain the basics steps you need to start building credit. Hello and thank you so much for joining us on Financial Aid for You. My name is Jennifer Frakel, I am with International Student Loan and today we’re going to look at credit scores, and why you as an international student should care. A credit score is a numerical value on your credit worthiness. So basically, how reliable are you when it comes to paying back your bills on time? You may be wondering why you should care – remember that your interest rate for loans etc. will all depend on your credit score. There are interest rates on lots of things, for example: student loans, credit cards, insurance, and car payments. So it’s important that you have a great credit score to ensure you have the lowest interest rate possible. Your credit score can also affect your housing opportunities. Have you already been looking for housing or about to start? Many landlords and leasing offices will look into your background to see exactly how reliable you are when it comes to monthly bills. Needless to say, you need to focus on keeping your credit score high to ensure you have more options in regards to apartments or housing accommodations while continuing your education in the U.S.
Lastly but most importantly, potential employers are going to want to ensure you are a responsible and reliable person. And of course not every job will look at your credit score, but a good number will. So now that you understand exactly what a credit score is, I’m going to explain how to ‘get’ a credit score in the first place. There are quite a few ways this can be accomplished, so we’ve broken everything down into 4 simple steps. Step #1: Get a TIN (Tax payer identification number) or SSN (social security number) - If you are an international student without a job, you may not have a social security number but you will probably have a TIN number because all international students have to pay taxes. So make sure you get one of the two so that your timely payments will be recorded towards your credit score. Step #2: Apply For a Credit Card - When applying for a credit card, be sure to check with your college or university first because a lot of schools have agreements with credit card companies to make the process easier. Your credit limit may be small (like $500) or large, but regardless of the limit, having a card will help your credit score. Step #3: Ask Your Landlord, Phone Company, Etc. To Record On Time Payments – Remember that companies aren’t responsible to record your on time payments, but you can always ask since it will boost your credit score. Step #4: Be Patient – Building your credit score doesn’t happen after night. It is called ‘history’ after all! Establishing a good line takes between 6 and 12 months, so don’t expect it to happen overnight. We hope that this video has helped you figure out how and why you should work to establish both a good credit score and credit history. If you have any questions or comments, join the conversation on Twitter #FinancialAidTalk.